COLUMBUS, Ohio – The Portland Timbers qualified for the 2016-17 Scotiabank CONCACAF Champions League thanks to a 2-1 victory over host Columbus Crew SC in the MLS Cup final on Sunday. Diego Valeri and Costa Rica international Rodney Wallace scored to give the visitor a 2-0 within the opening seven minutes, while Kei Kamara replied in the 18th minute. A capacity crowd of 21,747 at MAPFRE Stadium was stunned as the Timbers generated the fastest goal in MLS Cup history, striking only 27 seconds after kickoff. Goalkeeper Steve Clark took an awkward touch near the edge of the six-yard box off Wil Trapp’s innocently played backpass. Valeri hustled towards the ball and his slide tackle sent it directly into the back of the net. Portland doubled its lead in the seventh minute under controversial circumstances. The ball appeared to go out of bounds near the midfield line, but play continued and Lucas Melano eventually delivered a looping cross from the right flank that the diving Wallace headed home from seven-yards out. Eleven minutes later, Crew SC halved the deficit through Kamara, who slipped in the box and then – while getting to his feet – bumped into Portland goalkeeper Adam Kwarasey as he attempted to corral a deflected cross. Kamara eventually gained possession of the loose ball and was given time to take a few touches prior to firing in with his right foot from eight-yards out. Portland, which was featured in a CONCACAF-produced documentary earlier this year, came close to extending its lead in the second half, hitting the woodwork twice. An effort bounded off the crossbar ten minutes before Fanendo Adi’s long-range header hit the right post in the 71st minute. 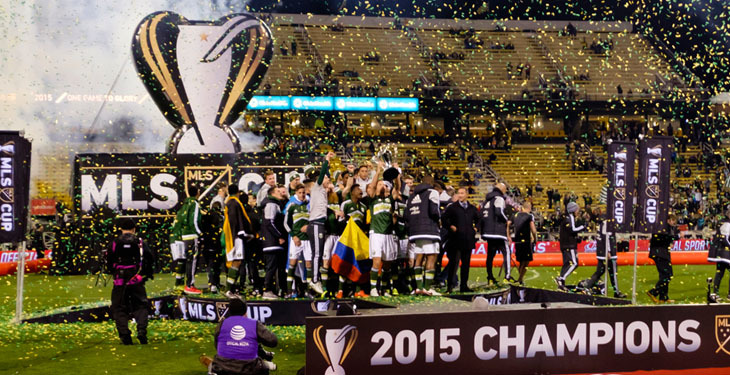 The Timbers will be making their second SCCL appearance next year after participating in the 2014-15 edition. Ep. 187: CantinaMX Podcast – Boy to Chivas!